The US Coast Guard has been seizing record amounts of cocaine, bringing in more than 458,000 pounds during fiscal year 2018, which ended in September. That was down slightly from the record 493,000 pounds seized in fiscal year 2017 but more than the 443,000 pounds intercepted in fiscal year 2016, which was a record at the time. According to the DEA, an increasing portion of that smuggling is going around the Galapagos Islands. A large ship like a freighter or a commercial fishing boat, the "mothership," approaches the Galapagos with a load of drugs. It would then be moved to smaller vessels heading north. 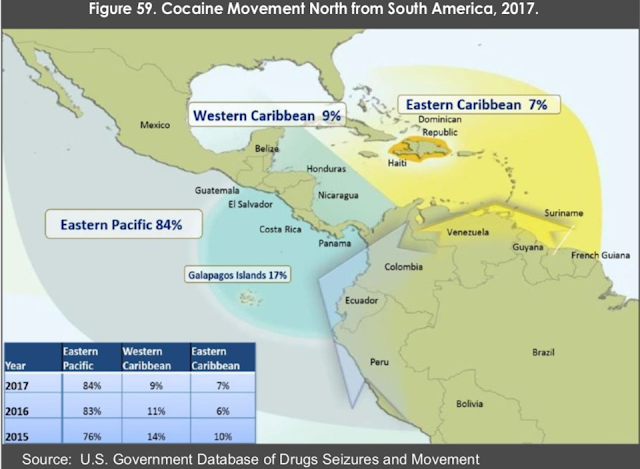 Cocaine production in Colombia, the world's largest producer, has more than quadrupled since 2012, according to the DEA.